Data quality is the degree to which data meets the purposes and requirements of its use. It may refer to completeness, accuracy, credibility, timeliness, accessibility, consistency, or other factors. Data providers ensure quality of their datasets, by research design choices, and how they choose to review, document, manage, and share datasets. Data curators work with the research community to address consistency, coverage, and metadata. How does your discipline define and address data quality? 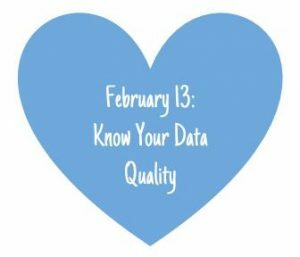 What tools and methods can you use in support of data quality? How can we distinguish between good and bad data? Responsible conduct in data management guidelines from the Office of Research Integrity discuss integrity and quality assurance. Social science data preparation and archiving guide from ICPSR on quantitative and qualitative data. Digital humanities data curation practices and their impact on data quality. Cell culture research and applying best practices to ensure scientific reproducibility. Data quality assessment (provides a table of various quality dimensions and their definitions) from Communications of the ACM, 45(4), 211. How Do We Define Clinical Trial Data Quality if No Guidelines Exist? Show your most recent dataset (or part of it) to your colleague and ask their opinion of its quality (exchanging datasets with a colleague makes this activity more fun). Use criteria for good data (e.g., completeness, accuracy, fitness for use, documentation) to assess where your data stands. Discuss your approaches to data collection and measures you took / could take to ensure integrity and completeness of your data. Discuss steps to address missing or incomplete data in the context of your research. Does it matter? How much missing data affects validity, reliability or trustworthiness of your conclusions? Check out the Calling Bull**** Course Syllabus (e.g., Food Stamp Fraud or the Musician Mortality Case Study) What can we learn about data quality from these stories? Share a tweet about today’s message with #LYD17 , or use #WhyILYD17 and you’ll be entered in a raffle for a book from Facet. Adopted with permission from the international Love Your Data Week 2017 materials. This entry was posted in Data cleanup, Data quality, Documentation / metadata and tagged Love Your Data Week, LYD17. Bookmark the permalink. Subscribing signs you up for monthly newsletters.